About one-quarter the size of the United States, with a wide variety of terrain, including a portion of the Virunga mountains in Africa’s oldest national park (Virunga National Park). Varied climate, flora and fauna, including many unique species. Includes large areas of forest and biodiversity located outside of protected national parks. 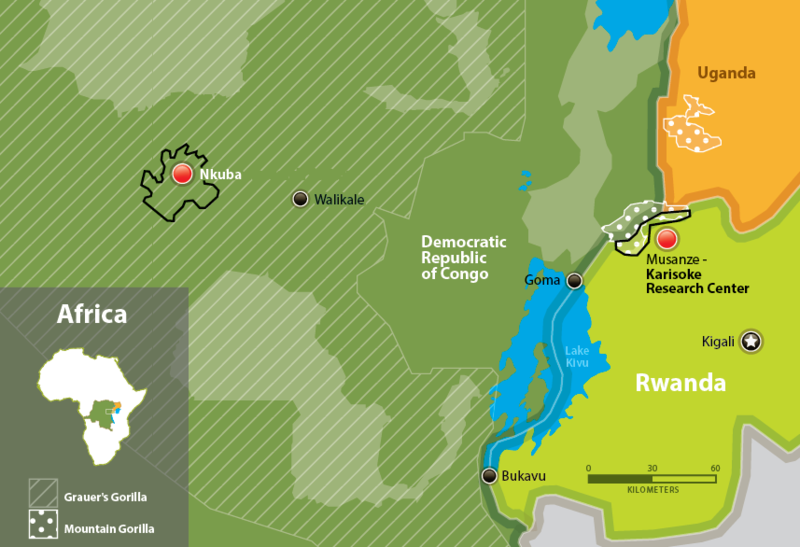 Home to two types of eastern gorillas: Mountain gorillas in the Virunga area, and Grauer’s gorillas in areas further west. Many ethnic groups, languages and dialects. A rich supply of natural resources. Several decades of security problems, conflict and instability. Extreme poverty in many areas, lower population density in the eastern section. We currently work in two areas where critically endangered Grauer’s gorillas are located: in Kahuzi-Biega National Park and in community forests in the Nkuba area. Kahuzi-Biega park contains the only habituated Grauer’s gorillas, which are monitored and protected by the Congolese wildlife authorities (ICCN). In Nkuba, we monitor and protect groups of Grauer’s gorillas that live outside protected areas in remote forests that are threatened by mining, hunting and other illegal activities. The Grauer’s gorillas we protect are not habituated to the presence of humans, so our trackers follow them at one day’s distance, using signs such as night nests, droppings, food remains, and footprints to document them. Providing much-needed employment by hiring community members to work in our protection, scientific and community engagement programs. Working with traditional landowners to establish a governance system for the long-term protection of their forests and biodiversity. Developing community farming projects and teaching necessary farming skills to help provide alternative food sources to villagers. Providing education and infrastructure programs centered on education, health and livelihoods. Building a new health clinic for the Nkuba community. Teaching classes at local colleges and universities. Identify remaining populations of Grauer’s gorillas that need protection. Work with local communities to increase the number of Grauer’s gorillas protected by developing community conservation forests. 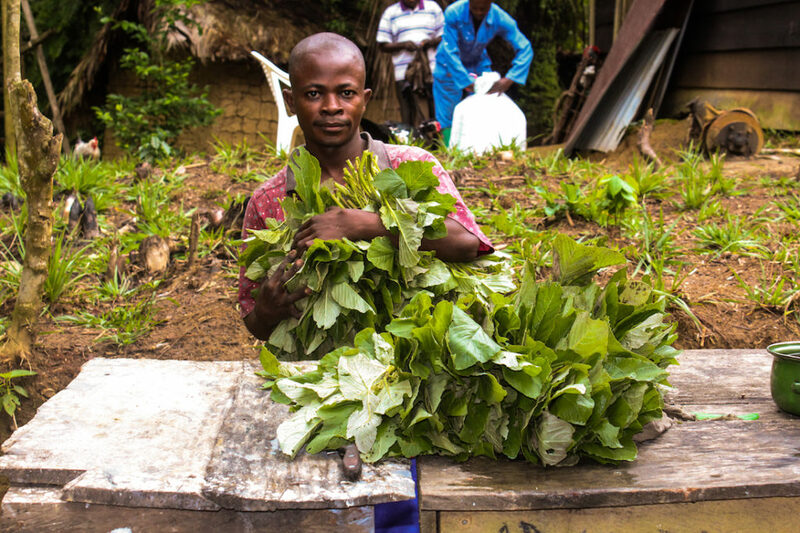 Help local communities rely less on forests for food by introducing alternatives such as improved farming techniques and crop diversification. Address community needs, such as education, livelihoods, and improved infrastructures. Understand the roles that mining and other illegal activities play in the loss of gorillas and other biodiversity, and develop interventions to address these threats. Most Grauer’s gorillas live in remote areas outside of national parks and are not formally protected. Mining and other illegal activities are common in the region where gorillas live, leading to increased hunting and deforestation. Local communities often suffer from extreme poverty and malnutrition and still depend on the forest for food and other resources. Numerous rebel groups operate within the forests, which makes protection extremely difficult and dangerous. Click here to learn about our work in Rwanda.